Useless Ramblings: # 40 - Cool it, Kohli ! # 40 - Cool it, Kohli ! To call Kohli a fine cricketer would be an understatement. He is arguably an 'all time great' at the age of 28, and at the rate that he is going, he is quite likely to surpass Sachin Tendulkar's records, something we were convinced a couple of years back, were unbreakable. He is also a marketing juggernaut, ubiquitous in a way that would make Amitabh Bachchan worry. The guy is everywhere, when he isn't collecting man of the match trophies or smiling for the cameras, he is wishing his own mother and Anushka Sharma on Women's Day on social media, thanking them for making him the man he is. He owns a soccer team, is the highest paid sportsperson in India and the no. 1 Batsman in the world, has a clothing merchandise brand (called WROGN) and makes more than 130 crore rupees a year. He is also, when his PR team isn’t there to give him directions, somewhat of a brat. In his own words, he 'likes to give it back, as much as he gets'. If that means showing the finger to the crowd (Sydney, 2012) so be it. "Because aggression is all about MC BC"
But maybe that's a part of his charm and why brands love him; here is a young, immensely successful man captaining his country's cricket team across all formats, assured of greatness, humble in an odd Delhi-esque way (bahar kuchh bhi karu, hu toh main mamma’s boy), has a movie star for a girlfriend, stands up to trolls as opposed to ignoring them, and of course, gives it back. An Aussie cricketer had once remarked that Virat has an Aussie side to him, meaning that Kohli has aggression levels not usually associated with us Indians. As this series has shown, not quite. Steven Smith, in spite of being Australia's captain, is never in the limelight like Kohli is, this has less to do with his cricketing abilities and more to do with the fact that Australians don't hero worship cricketers the way we do. It's probably due to the fact that Australia is pretty good at every sport, unlike India. We have a serious dearth of sporting icons here and Cricket is the one team sport where India enjoys an enviable level of dominance, at least when the games are played in the sub-continent. Smith isn't considered to be a cricketing great, while he has been ranked no. 1 in tests, he lacks the flair of Kohli and isn't in possession of a technique that makes for good looking cricket. If anything, his shots are, more often than not, quite ugly. But compare his track record in Tests, vis-a-vis Kohli's, and you'll find that there's not much separating the two, in fact, arguably Smith is just marginally better - and that's why I was looking forward to the series. It was a foregone conclusion that India would clinch it, some, such as Dada even predicting a whitewash. But it was the relishing prospect of the showdown between the captains had me excited, a battle between equals. Who would prevail over the other? Turns out the series was more evenly contested than we ever thought, the Australians punched well above their weight, and while India did go on to win the series, the Australian team wouldn't be too unhappy with the way they performed. Smith didn't disappoint, but Kohli sure did. He failed with the bat, scoring 46 runs in 5 innings; Smith, on the other hand, scored 499 in 8 innings (average of 71.28, 3 centuries), more importantly, he was probably the one man who stood between India and victory, more than once. Smith was, without a doubt the better performer in what turned out to be an anticlimax of a contest. Of course, there was the brain fade moment, which was obviously, in Smith's words....'stupid'. Kohli was right to point it out to the umpire. What happened next, however, was shocking [Sorry ScoopWhoop], Kohli stopped short of calling Smith a cheat, he made it pretty clear though what he really felt about Smith and the Australian team in general. There was the shoulder gesture by Maxwell, but too big a deal was made out of it, we have done similar things, remember Shikhar Dhawan mocking Shane Watson? Not really a classy move but nothing to get worked up about either. There was some vague allegation regarding the Aussies insulting India's physio, which sounds far fetched unless Kohli meant that the shoulder gesture was indirectly insulting the team physio for his lack of competence (Eh?). 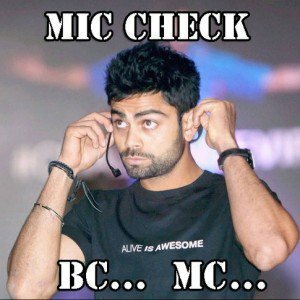 Kohli said something to the Australian media to the effect that they are the ones unnecessarily asking controversial questions, and questions that have nothing to do with the match. Media, whether Indian or Australian or Italian, tend to do that, it's your call on how you answer those queries, Kohli had the opportunity to win brownie points with Australian media (and the Australian people) and much like his on-field shot selection, chose to play it the worst way possible. Smith may have called Murali Vijay a 'f****** cheat', but he manned up and admitted to his mistakes, being apologetic when you have made a spur-of-the-moment mistake (or a wilful one) makes you more human, with that he won a lot of us over (including Sunil Gavaskar) - Smith was gracious in defeat. Kohli on the other hand, in a move that can only be called childish, said that he wouldn't call the Australians his friends anymore. Exactly the kind of words I would expect from a playground bully who has just been bullied himself, or the response of a guy who has been dumped by his girlfriend and has been offered the chance to remain friends. Why is the captain of the team that has just won a series, whining? Certainly not expected from the man who is the best batsman in the world. Where did all the self-assuredness go? The thing is, maybe the guys in the team are not as good with sledging as they think they are; the great sledgers know how to take it, how to give it back, and when to stop. We, on the other hand, pretend to be tough, abuse freely and consistently (particularly since the Ganguly era), but more often than not, fail to back it up with our performances. Think Glenn McGrath or Steve Waugh, they swore like sailors and you knew that they could take the game away from you. Ishant Sharma can make faces all day, but very rarely does he produce something with the ball that is half as threatening (though he has been decent this series). 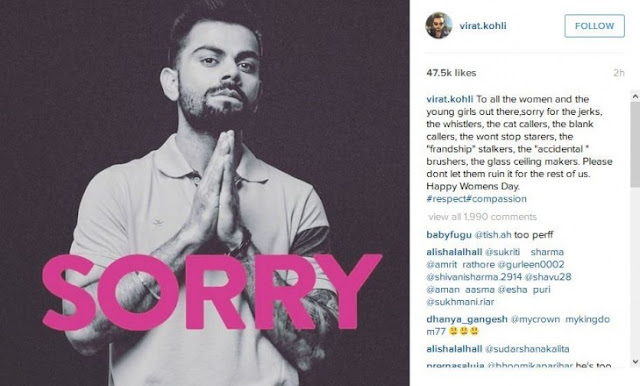 No matter what Kohli says or how many times the camera catches him mouthing abuses of the incestuous kinds, it appears that he was been deeply affected by what was a very obvious attempt by the Australian cricket team (and support staff, and media, and former players) to target him. And he couldn’t handle the pressure. The Indian media bayed for Smith’s blood; I have the feeling that the crowd who showed up to watch the games weren’t very friendly either, and while Smith has played in India before, I don’t imagine the conditions exactly suited him, yet he played on, and on, and on; making runs, not a treat for sore eyes, but playing test cricket as it is meant to be played. Displaying grit and character (most of the times). I am sure that Kohli will go on to have a fantastic season, and he will continue to break records, but in spite of everything, he won’t be half a decent ambassador for the sport in a way Tendulkar or Dravid ever was. And sometimes, that is more important than everything else.